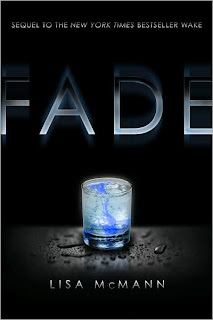 After finishing the wonderfully creepy Wake, I couldn't wait to extend my time with Janie and Cabel in Fade. The story picks up shortly after the end of Wake. Janie and Cabel are finishing up school, looking forward to the day when they can leave Fieldridge High behind and try the freedom (and anonymity) of college life on for size. And if there are a few key, seemingly insurmountable obstacles in their way, well, what's the use of letting your worry play on an endless loop? Particularly when real, peaceful, be-who-we-are moments are so few and far between. When Captain hands them a new case to pursue, Janie and Cabel have no idea how far it will take them from those peaceful moments together. Cabel, particularly, begins to doubt the worth of their involvement when he realizes the case centers around a possible sexual predator(s) at Fieldridge High. That and the fact that Captain intends to dangle Janie out there as bait. What Cabel doesn't know is Captain has also handed Janie a folder. One that holds the contents of her predecessor's experiences and warnings as a dreamcatcher. Emphasis on the warnings. They are dire. As Janie works day and night to catch the predator and understand her abilities, Cabel tries to help but finds most of his time taken up worrying over Janie. My favorite thing about Fade is that spare, distilled writing Lisa McMann excels at. It's a pleasure on ice to turn the pages and simply absorb the clean, concise lines of the story. I did find myself wanting a bit more in some areas. Janie's mother remains all but nonexistent and one begins to wonder just why she's there at all. And how she could possibly be that much of a nonentity, scores of empty bottles notwithstanding. I keep feeling like she's going to play a larger role at some point, but it must be yet to come. I also felt that everyone around Janie should have seen the eventual crisis coming from a mile away. (I did). And so I spent the last portion of the book gripping the pages, internally ranting that this shouldn't. be. happening. And wishing someone would listen to Cabe and not let her go there! That said, any scene Janie and Cabe are in together is breathless and lovely. And I really liked the developing relationship between Janie and Captain. Girl needs some halfway decent adult taking an interest in her life. Once in her bedroom, Janie closes the door tightly behind her. Falls to the bed, like a lump of dough. After last month's ordeal with the drug bust, Janie knows she's got to get her strength back or the dreams will take over her life again. That night, Janie's own dreams are blasted with churning oceans and hurricanes and life jackets that sink like stones. Janie wakes to sunlight streaming in. She's ravenous and dreaming about food now. Smelling it. "Cabe?" she mumbles, eyes closed. "Hey. I let myself in." He sits on the bed next to her, his fingers drawing her tangled hair away from her face. "Rough night, Hannagan? Or are you still catching up?" "Mrrff." She rolls over. Sees the plate of eggs and toast, steam rising. Grins wide as the ocean and lunges for it. "You--best secret boyfriend ever." The third and final book, Gone, will be out February of next year.